The full-body hammock is the ultimate in reclining relaxation. 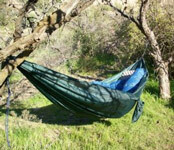 There are different styles and sizes of hammock to also consider. Some are lightweight and portable, others stronger and larger. And there are a wide variety of colors and materials available. On the comforts of hammocks, some people swear by a quilted type. Consider that with ropes, or cords, the hammock mesh is formed of interwoven cords, and essentially your body is supported with pressure onto these cords. Unless the cord mesh is very fine, or you are wearing a minimum layer of clothing, you can have the effect of the cords cutting into you. On the other hand, there is nothing like a true mesh hammock for breathing, especially when trying to stay cool in some hot weather. Take a look at the Mayan Hammock design below, for a good middle ground between the quilt and the cord. What is it made of? There are variations in materials, even among a single design of hammock. The cotton is regarded as the softest in feel of all. The nylon hammock is a bit sturdier and more durable in high humidity. Nylon, however, can be less successful in high sunlight environments. This is because today's nylon hammocks are actually polypropylene, which gets degraded by UV radiation. All hammocks can fade over time, particularly the darker colors. Where to put it? For camping and outdoors, the question usually comes down to a couple of trees you can sling it up between. Consider a mosquito netting, or your relaxation time may become interrupted by stress and itch. For indoor fixtures, usually walls are the standard mount point. But really, as most hammocks are designed for 2 point support, any 2 points that can be secured tightly can make good mount points, with a little ingenuity. How to hang it? A first suggestion is wherever your choice of location, pull the ropes until they are tight. A rule of thumb is to have the low point of your hammock be at least 2 feet off the surface, more if it is a longer overall size between the mounts. To do this, try to make it tight so it's basically flat when idle; then when in use it's center of gravity should drop down to near that target low point. Different materials have different elasticity factors (they stretch a different amount), so you probably want to use design that allows you to re-adjust as needed, until you get just the right rope length, tightness, resulting in the right height. Another design factor to consider is the security of the unit. Think about things that might slip - and look to secure them so they don't. An S-hook can have a rope slip out, for example when someone suddenly gets up off the hammock. This can result in the hammock, and anyone or anything on it, suddenly crashing to the ground. A locking carabiner works better here. If your hardware consists of S-hooks, it's advised to look into some basic locking carabiners. (Even a non-locking carabiner can be opened by a twisting rope). Another thing that can slip is the knot itself. Use a good knot on your mount points. And any tree strap used should be set up to resist vertical motion. Make sure your entire support design considers the maximum weight supported by the hammock itself. The best? many like Mayan. 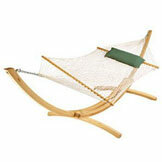 The Mayan Hammock is a light, woven webbing that opens easily to accommodate the guest. It is woven of thin strings, yet can hold up to several hundred pounds. Pound for pound, and dollar for dollar, it is considered the best comfort value available in the hammock market place (and for many people, the best in any relaxation space). Our vendor has an outstanding Mayan hammock to consider. In especially hot weather, a hammock above ground in a little breeze will be the ultimate natural cooling, not to mention eco-friendly. Mounts between any two points that are high enough. Plenty of creative DIY solutions are available for mounting. This Travel Hammock is available from our affiliate Vendor, Amazon . It's lightweight and designed for camping, backpacking, or other portable relaxation situations. It comes in 3 colors, and is proven for its ease of use and durability. It's still necessary to plan for how to mount it. Hammock Pawleys Island Tree Straps are a great solution for the portable hardware issue. Tree-friendly, of course, and not hard to use. A The frame designs shown below are good examples of the variety of places the Mayan style can be used. It's about the most versatile of any hammock. Not to mention colorfully stylish. Look Here for our Vendor's selection of Maya Hammocks. This example is available from our Vendor. It's duracord is designed for strength and durability, springs and summers year after year of stress-free hammocking. And it's stronger than most. Great for an outdoor choice where you want to relax, and definitely want to leave room for your spouse when the time is right. Pawley's Island Original Collection Large DuraCord Rope Hammock, Antique Brown as offered by the excellent manufacturers at Pawley's. This support design is a clever use of minimal gear, and fairly easy to set up. However, make sure the parts are firmly stabilized. Two poles join to make an arch; two arches combine with a lateral stabilizer rope to make the frame. From here, any hammock can be suspended. By readjusting the rope, it is relatively easy to change the length of the frame, unlike with a fixed frame design. The Mayan style hammock is a great choice for either Pole and Rope or the Structural Mount designs. This example is a dedicated hammock mount for a side of the yard. This hammock has a narrow width, so not ideal for more than one person, but has the advantage of using less space. This is a great readers' design, also great for dozing. The photo shows a particularly strong frame, able to withstand years of exposure to the elements. The hammock mounting hardware (hooks or eye bolts) can be permanently fixed and the hammock removed when not in use. This example shows one standalone solution for setting a hammock in place. The frame is quite large, and solid wood. It just fits the Hatteras style white hammock shown. The polyester fibers may not be as comfortable as cotton, but do wear well outdoors and don't stretch over time. This hammock structure, like the Pawley Island, maintains shape well to be able to use a wider area with either one or two persons. (Even three if they are small). Check out this Hatteras P-14 Deluxe White Polyester Rope Hammock available now from our affiliate. A great hammock for lovers, also TV watchers.